We will show you how to shine the lights in Vector’s Cube at 6 different colors using the Anki Vector SDK in Python. Vector has a cube that he can play with. The cube has lights which are RGB LEDs which can display multiple colors. You have probably seen these lights turn on in Vector’s cube when he is doing his thing. We will be writing a program so Vector’s cube can shine at different colors. This is a fairly straight forward program that we’ll be writing. Let’s take a look at the commands we’ll be using. Not a ton going on here. So we can jump in to the code. Again this is a shorter program than usual. We wrote this with the Anki Vector SDK in Python. We do the usual imports with anki_vector and time. However this time to keep things a little cleaner we did from anki_vector import lights. The main function is called and we connect to the cube. The colors are set. Currently I can only get the cubes to shine at these 6 colors instead of full Rainbow Cubes like with Cozmo. We sweep through these 6 colors 5 different times, and we have Vector set the lights for his cube to those colors. At the end, we make sure to turn the lights off on the cubes with cube.set_lights_off(). Hopefully that makes sense. If not, you can always copy and paste the code to use it yourself. One thing we will be doing is getting this to work as RGB. As for the code, let’s look at a few other things. How would you shine a white light? What if you wanted the lights to shine a color for longer, or for less time? Is there a way to make each corner of the cube a different color? If you found this interesting we write about a lot of similar stuff at Kinvert. We have also written about Cozmo Vs Vector and the Anki Cozmo SDK. 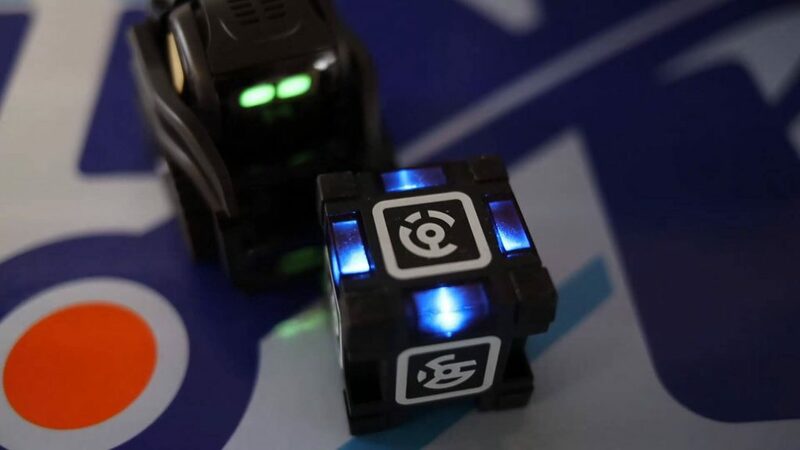 We have many Cozmo Examples and Vector Examples, as well as Games You Can Play With Vector. If Python isn’t your thing check out What is Robotics, Block Coding, and Age to Teach Kids Python. Finally, we have a mailing list with lots of great tips and tricks on Vector as well as Cozmo if you want. You can unsubscribe at any time.